Dean Smith left $200 in his trust to every one of his varsity basketball letterman he coached in his career. 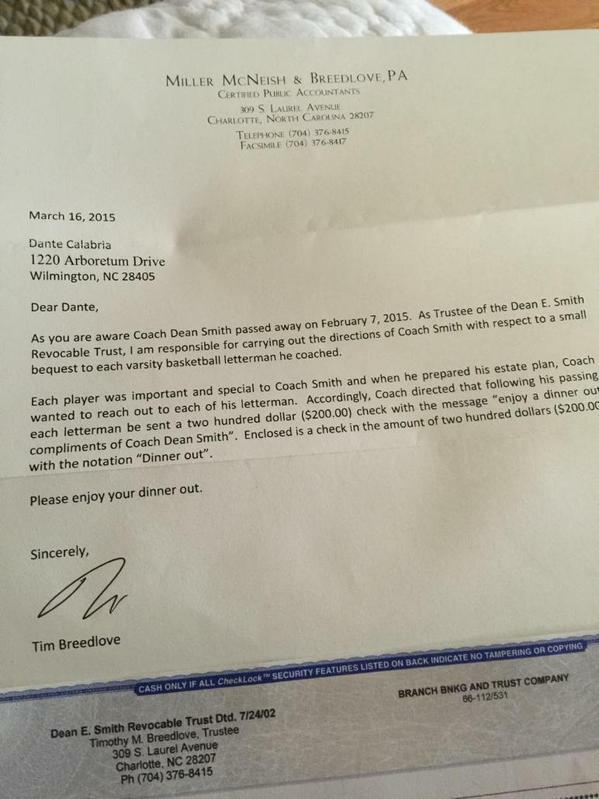 Smith had his trust send the $200 check with a message of "enjoy a dinner out compliments of Coach Dean Smith." Smith passed away on Feb. 7 at the age of 85. Smith won two National Championships, while also appearing in 11 Final Fours and winning the ACC regular season in 17 seasons. MJ getting a check from Dean Smith? That is as equally dignified of coach Smith as it is sad at the same time. His players get to dine out and remember their coach. Pretty cool. The NCAA really.. REALLY FREAKING looked into this as if it was a violation!??!!?? WTF!!!! I understand the NCAA point though. Dont change your point of view, but change your perspective. If this simple gesture, which is just a nice thing to do can be done....whats to stop larger and more "generous" after death gifting in the future by coaches, . The rules state something along the lines of no gifting from the university, coaching staff, alumni or any of their associates being allowed during or after a players tenure.Or all parties involved will face penalties, fines, law suits, etc. But you cant discipline anybody after their dead. So how do you stop a University, coach, alumni, etc. from recruiting players by promising money after someone dies 35 years from now? Additionally imagine all the broke, down on their luck ex collegiate players that would be killing off whoever necessary to get their checks. What Coach Smith did was a nice thing, I dont think anyone is questioning that. But its opened a door that others to follow will exploit. And whenever theres a opportunity for something like this to happen....it happens. Maybe its happened already and this was Coach Smiths way of leading the NCAA to investigate it. Ya never know? The NCAA makes billions off these athletes in exchange for a free education and unlimited college booty, but is going to investigate $200 checks? Edited by Massacre, March 30, 2015 - 08:03 PM.